Geo-information Science and Earth Observation (GEO) at ITC (University of Twente) is a two-year Master’s programme, with both years divided into four quartiles of ten weeks each. The study load per quarter is 15 credits (ECTS), equalling 420 hours of study; the total study load for the programme adds up to 120 credits. With our online studyguide tool, you can create your own, personal study programme. When you're done, you can download a customized PDF studyguide. You will spend most of the first year taking courses and working on projects. This first quartile is also available in an online learning format, where the face-to-face instruction is replaced by an online part-time course. Subsequent quartiles in the first year are dedicated to courses in your chosen field of specialization (28 credits), a common course on how geo-information science and earth observation address global challenges (7 credits), and a course of your own choosing (also known as an “elective”; 7 credits). In addition, you will be acquiring important academic skills throughout the first year (total 4 credits). Between the first and second year, there will be a summer break of about 8 weeks, allowing you to travel home, discover Europe, take additional summer courses and/or start preparing for your Master’s research. The second year of the programme leaves you lots of freedom to make your own choices. Upon successful submission of your MSc proposal you will spend most of your time doing research in the frame of on-going research projects and working on your thesis under the guidance of experienced research staff. The joint study load for your MSc proposal and thesis will be 45 credits, whereas your individual programme will amount to 15 credits. 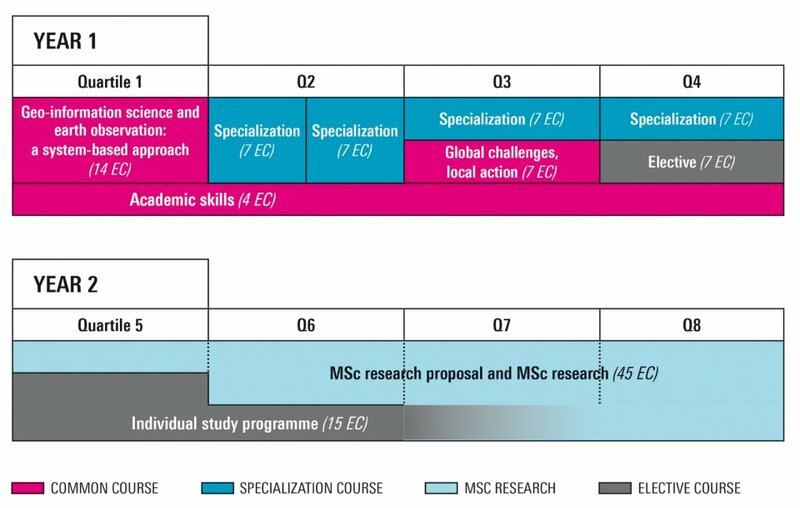 To support your research you will assemble an individual study programme involving additional elective courses, an internship and/or courses at other faculties or universities. Your research activities could include doing fieldwork elsewhere in the world − e.g. in order to collect data to support your thesis. You will have ample opportunity to personalize your programme. A full list of courses that are part of this Master, as well as detailed descriptions of all of them, can be found in the online studyguide tool.